Jim Aylward Jr. with his Massachusetts State Lottery check. Not only did the Boston Red Sox win the 2018 World Series, they also helped an 84-year-old Templeton man win a $100,000 grand prize Monday in the state’s Mass Cash game. 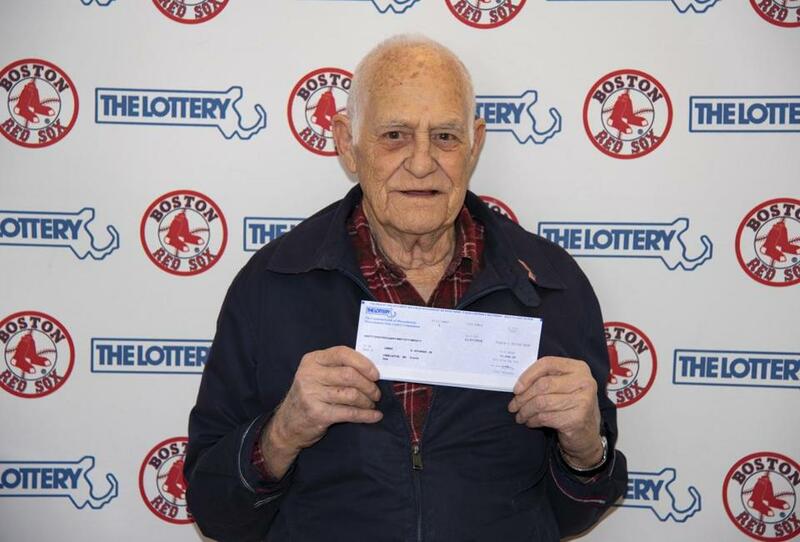 Jim Aylward Jr. — a great-grandfather — won the prize by playing the jersey numbers of five Red Sox players from the World Series winning team, the lottery said in a statement. “I was shocked when I won,” Aylward said in a telephone interview Thursday. “I’ve won $250 and stuff, but not a real big one.” He added that he won $5,000 from the lottery a couple of years ago. Aylward selected the winning combination of 11-16-19-22-25, representing the jersey’s of Red Sox players Rafael Devers, Andrew Benintendi, Jackie Bradley Jr., Rick Porcello, and Steve Pearce, according to the statement. All five numbers matched the winning numbers selected in Monday’s Mass Cash drawing, the statement said. Whenever Aylward buys a lottery ticket with six numbers, he said he uses the same combination, but adds retired Red Sox player David Ortiz’s jersey number — 34. Aylward, who has five children, nine grandchildren, and four great-grandchildren, claimed his prize Wednesday. “I’ve already given out a lot of the money to my five kids,” Aylward said, but he made sure to keep some for himself as well. Aylward bought his ticket at Cumberland Farms in east Templeton. Each ticket for the Mass Cash game is $1, and drawings take place seven nights a week. Players must choose five numbers from 1 to 35, the statement said. Katie Camero can be reached at katie.camero@globe.com. Follow her on Twitter @camerokt.